Roofing Glossary - Performance Roofing, Inc.Performance Roofing, Inc. The Maine Roofing Glossary: A Non-Roofers Guide to Roofing Terms. water from seeping behind the base flashing. of snow and ice and to deflect water around the chimney. Deck or decking: The surface installed over the supporting framing members of a roof. Many homes have decking made of plywood. allow water runoff to drip clear of underlying construction. 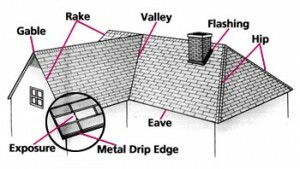 Eaves: The horizontal, lower edge of a sloped roof. Fascia: Vertical panels capping the perimeter of the gables and eaves of the roof. sometimes referred to as tar paper. Fire Ratings: Fire resistance ratings are established for roofing by ASTM and UL tests. withstand light exposure to fire originating from sources outside the building. opening. Sometimes called a pipe boot. on both sides of the steel. both sides of the steel. side of the ridge. The lower plane has a steeper slope than the upper. sides. This type of roof does not have gables at the ends. gutters. This water can then be forced under the roof deck and into the home, causing structural damage. insulation to keep the roof deck temperature in balance with the external temperature. Low slope roof: A roof that slopes between one and two inches per foot. vertical. This type of roof contains no gables. at the edge that facilitates water runoff, away from the building. the ridge to the eave. Re-roofing: Installing a new roof system on a building that is not new. vent must be coupled with adequate intake vents in the eave soffits of the home. Run: The horizontal distance from the eaves to a point directly under the ridge. many systems can be installed on shallower roofs. Steep slope: roof slopes greater than 21 inches per foot. Normal slope: roof slopes between 4 inches and 21 inches per foot. Low slope: roof slopes between two and four inches per foot. Tear off: Removing an existing roof system. Telegraphing: A distortion that may arise when a new roof is applied over an uneven surface. the old shingles are left in place. ventilating the underside of the roof deck. Your Source for Fast & Effective Roof Repair in Portland!